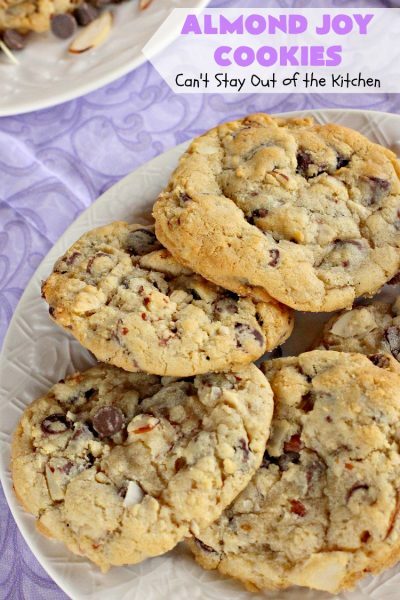 Almond Joy Cookies are spectacular. Happy Valentine’s Day! I have a sweet treat that you will rave over today! I LOVED these amazing cookies! 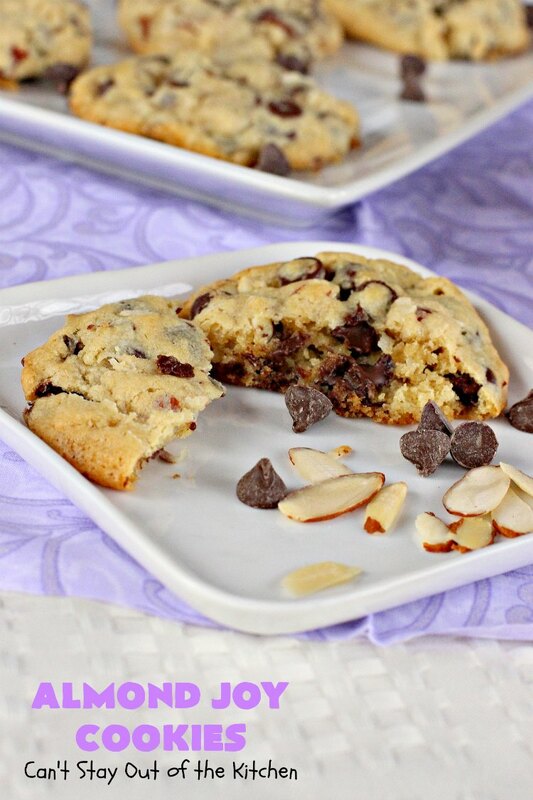 They are absolutely loaded with almonds, coconut, and chocolate chips. 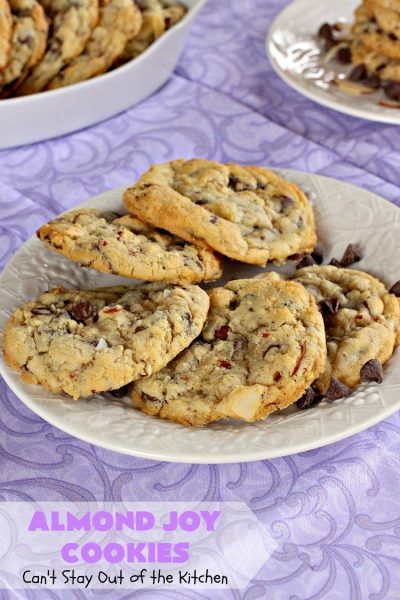 Chocolate lovers will adore these delicious candy-like cookies. 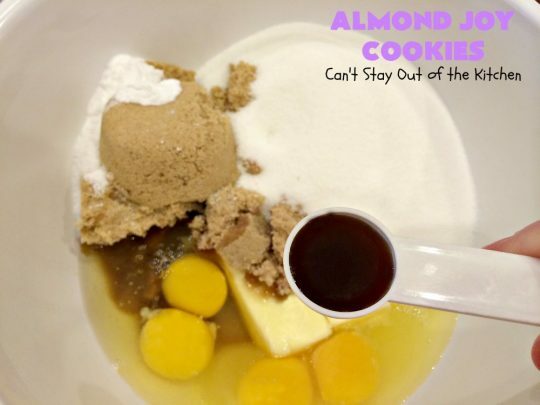 For those who love coconut and almonds as well, then you can’t do any better than Almond Joy Cookies. On top of all that, these cookies aren’t particularly difficult to make and don’t take all that long either. Several months ago, John saw a picture on FaceBook of Almond Joy Cookies and sent me the post. He thought I ought to give the cookies a try and I agreed. I tracked down the picture and recipe to its source and decided I needed to make them sometime. Well, that sometime came when one of his co-workers asked me to make some cookies for her wedding. I made a batch of these cookies, and wow, I’m glad I had to pack them off for wedding guests or I would have eaten ALL of them myself!….And this recipe makes a lot! 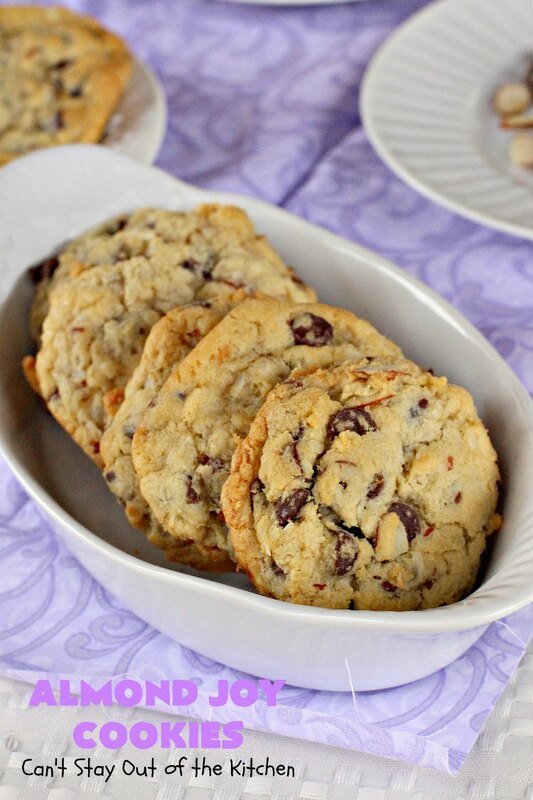 If you’re looking for a scrumptious cookie for holiday baking, parties, tailgating, baby or wedding showers, or just because you want to make a sweet for your sweetheart, then you need to make up a batch of these fantastic cookies soon. 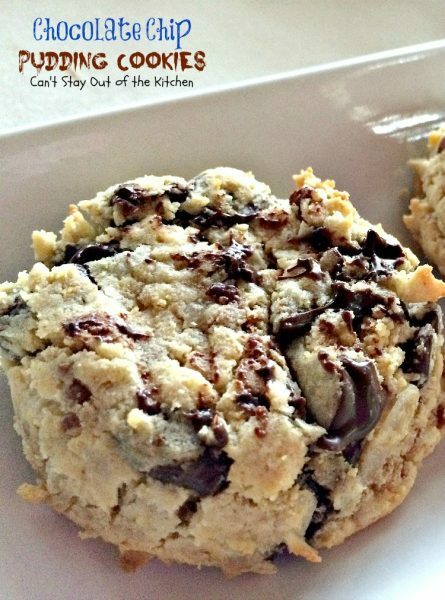 You will be hard pressed to keep your hands out of the cookie jar! And, everyone you share them with will want more, more more! Keep ’em coming! Almond Joy Cookies are spectacular! These cookies are loaded with 5 cups of chocolate chips, 2 cups of almonds, and 2 cups of coconut! WOW. You will drool over these cookies for sure! Almond Joy Cookies pack a powerful punch of chocolate! Measure butter, sugars, eggs, vanilla, baking soda, and salt into a large measuring bowl. Add UNBLEACHED all-purpose flour. Bleached flour toughens baked goods. 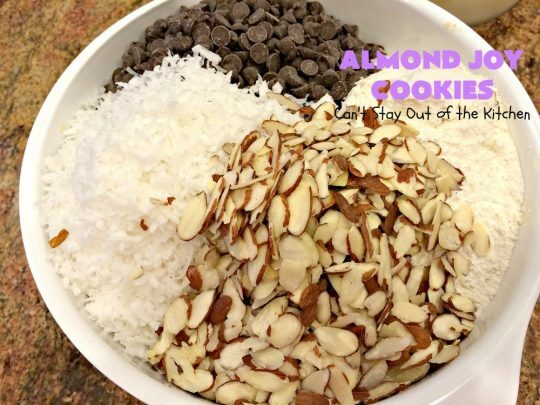 Add almonds, coconut and chocolate chips. You really need a large bowl to stir all of these ingredients together. Combine the ingredients with a wooden spoon. Roll mixture into golf-ball sized balls and place on cookie sheets that have been sprayed with cooking spray. Bake at 350 for 12-15 minutes. Because mine were a little on the large side, it took 17 minutes for them to bake completely. 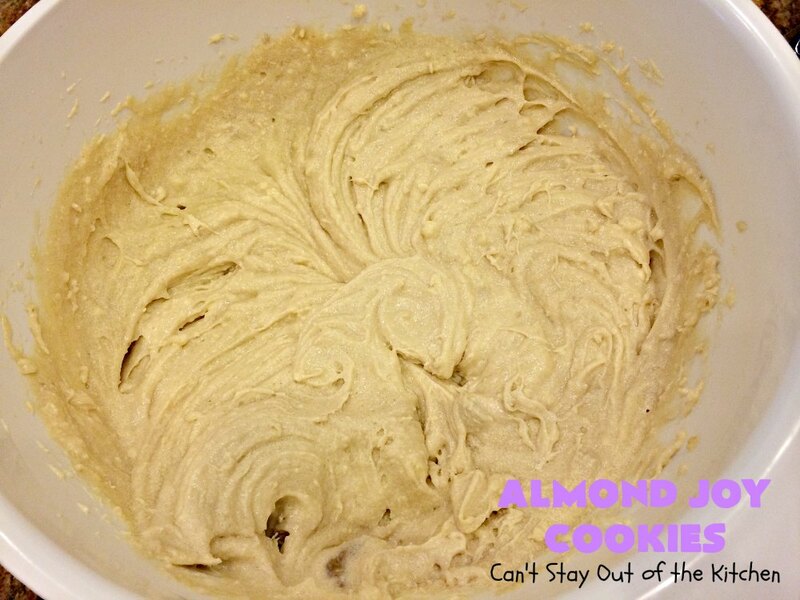 I made a batch of Almond Joy Cookies for a wedding….but I made sure I sampled one first! 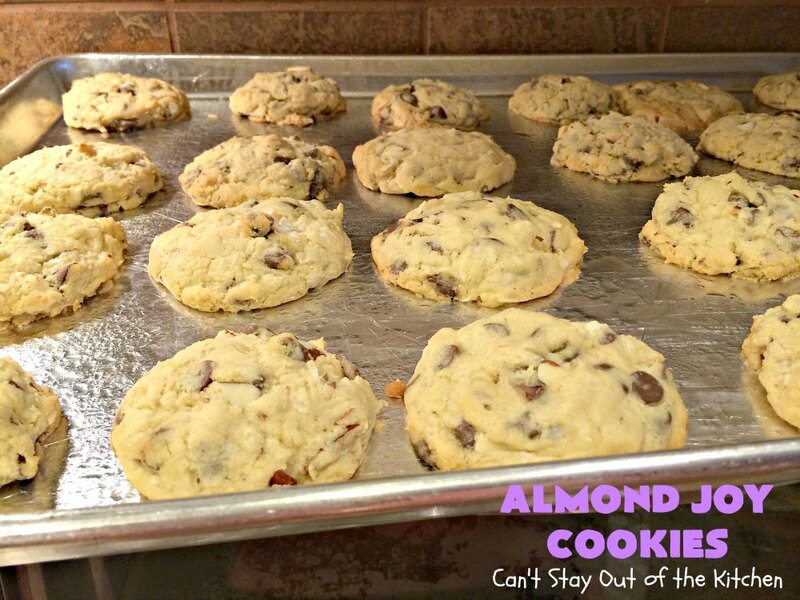 Almond Joy Cookies are great for tailgating parties or anytime you have company. 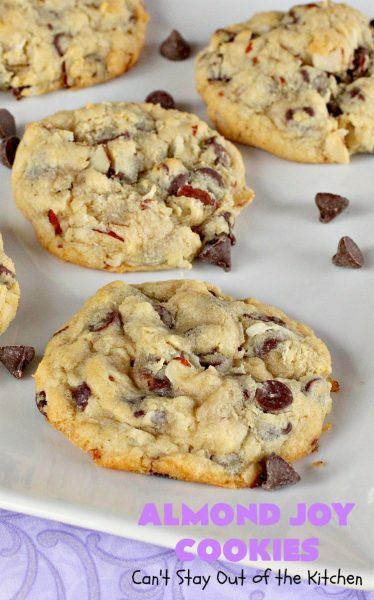 These cookies aren’t overly difficult to make, but they do take a LOT of almonds, coconut, and chocolate chips! Amazing cookies loaded with chocolate chips, almonds and coconut. If you like Almond Joy candy bars, you'll love these spectacular cookies! Terrific for holiday baking and Christmas cookie exchanges. In a very large mixing bowl, cream the butter, sugars, eggs, vanilla, baking soda and salt together with an electric mixer until well combined. 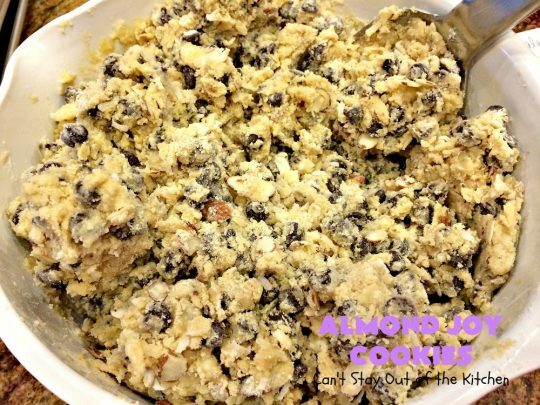 Stir in flour, chocolate chips, coconut and almonds. Roll dough into golf ball-sized balls and place on prepared cookie sheets. Bake for 12 to 15 minutes or until done. (Mine took 17 minutes). NOTE: You will need a very large mixing bowl to make this recipe. NOTE: Each oven is different. My batches took 17 minutes to bake completely. 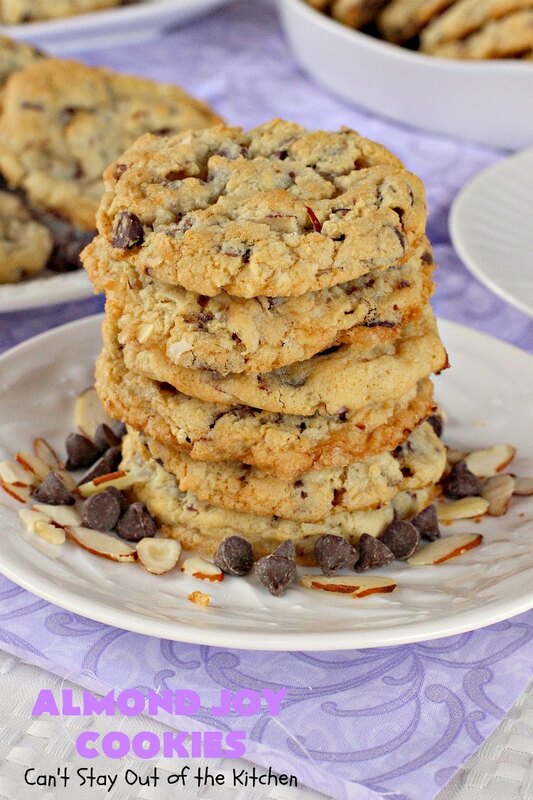 Amazing cookies loaded with chocolate chips, almonds and coconut. 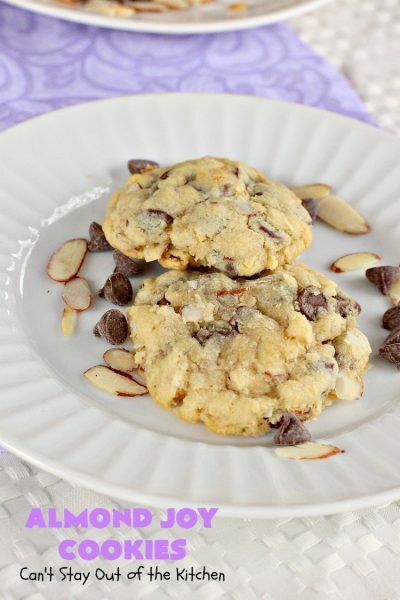 If you like Almond Joy candy bars, you’ll love these spectacular cookies! In a large bowl, cream the butter, sugars, eggs, vanilla, baking soda and salt together with an electric mixer until well combined. Don’t Almond Joy Cookies look marvelous? I baked these a couple of weeks ago and stashed them in my freezer for a wedding tomorrow! Chocolate lovers will get their fill with these scrumptious cookies! You may also enjoy these delicious cookies! Hey, Tina, I LOVE your changes! I think I may do the same thing next time I make them! I pretty much used someone else’s recipe and I know it uses a lot of chips. It’s been awhile since I’ve made them. Probably time to make them again! Thanks for letting me know. Ok so these do taste good, but I wasted the first batch because the instructions at the bottom of the page say to set oven at 375 degrees (which I did) but the text with the pictures says 350. The first batch was a little too done. Mine didn’t quite flatten out like the pictures show, but again still tasty. I did only 4 cups of chocolate chips because as I was adding them, it looked like too much. I also used an extra cup of coconut…Overall the cookies were delicious…thanks! I’m so sorry for the overdone first batch. My problem is even though my ovens test out at 350 they really end up cooking slower so I seem to have to cook everything longer than everyone else’s oven. If you add all the chocolate chips the cookies will probably flatten out more. If you used an extra cup of coconut that would definitely cause the cookies to hold their shape and not flatten out as much. When I bake cookies I always rotate the racks every five minutes (which I probably need to include in every recipe). But I also only bake them to doneness and not according to time because my ovens seem so crazy! I hope you try them again. Adjust your cooking time and go ahead and make with the amounts listed in the ingredients. If you bake at 375 allow less time and if you bake at 350 allow more time. Just watch them and take the cookies out when they look and test done. These look really good. i am wondering if there’s a way to make them without using a mixer, since i dont have one. would it work if i melted the butter? Hi, Leah. I would not melt the butter as it would change the texture and the cookies tend to run on the cookie sheet rather than hold their shape. Do you have a whisk or a rotary beater? Those can also be used with no problems. If you don’t have either of those, then I would make sure the butter is very soft. Leave it out on the counter for several hours so it is really soft. Then just beat the ingredients (before adding the flour, coconut, nuts, etc. ), with a wooden spoon until you have them as mixed and smooth as possible. This may take several minutes. Then stir in the final ingredients with a wooden spoon until combined. This is the way cookies used to be made before the invention of all the new stuff we have these days. It will still work today! These are such good cookies. I hope you are able to enjoy them for the Christmas season. Thanks Teresa, just saw your reply now. I will try leaving the butter out. Please let me know how the cookies, turn out for you, Leah. Pinned this cookie for later. It looks like one my husband would love too. Thanks, Barbara. I LOVE your blog. I pin almost everything because you present them so beautifully! Thanks for stopping by. These look wonderful, Teresa! My daughter would especially love these. Almond Joy is one of her favorite candy bars. I will have to make them for her sometime. I hope you have a great Valentine’s Day. Thanks for another fantastic recipe! You’re welcome, Shari. I’m sure your daughter will love them. They have so much coconut, almonds and chocolate chips. Yum. Yum. And while I’m thinking of it, we won’t be out to Arizona in April. John is having hip replacement in early April and so we won’t be traveling for a month or two after that!